Since 1964, electric cooperatives in South Carolina and across the country have been sponsoring high school Juniors on a week-long, all expenses paid tour of our nation's capital. Newberry Electric Cooperative sponsors two area high-school juniors on the trip each June. The student's parents must be a member of the cooperative to be eligible for the trip. Applicants are chosen based on the interview, academic achievement and community involvement. Informal interviews follow to choose three representatives for the co-op who then join 50 teenagers from across the state on the trip in DC. One lucky tour participant has the opportunity, through a community project, to win a $5,000 college scholarship. The scholarship is not based on SAT or GPA scores nor is it based on financial need of the recipient. 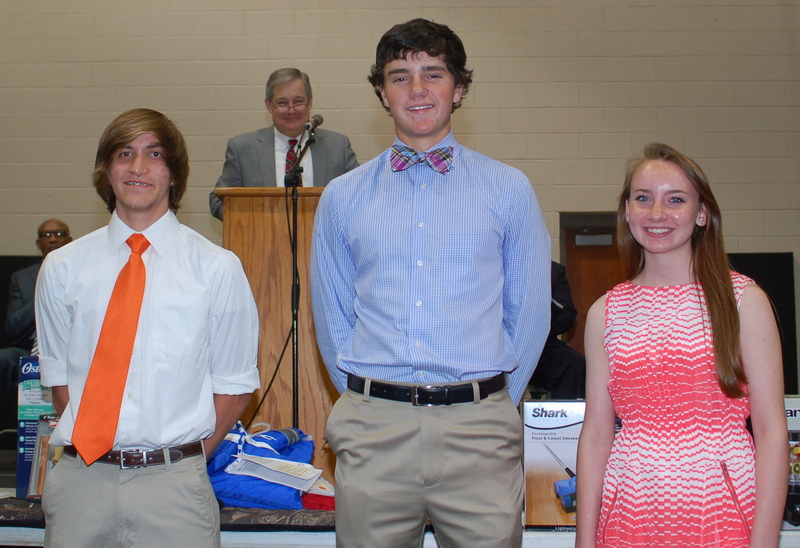 (l-r) Christopher Waites, Cole Nichols and Kelsi Metts. They are pictured here while being recognized at the NEC 2015 Annual Meeting.